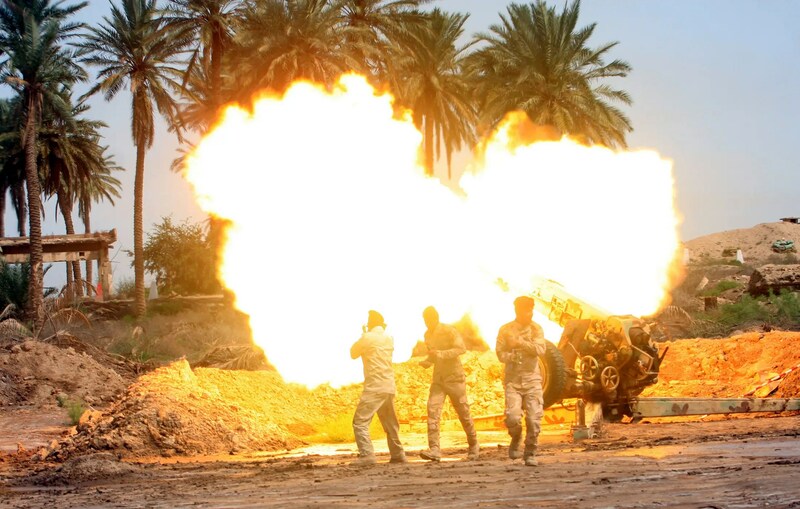 Iraqi security forces fire an artillery gun during clashes with the al Qaeda-linked Islamic State in Iraq and the Levant (ISIL) in Jurf al-Sakhar, 60 km (40 miles) from the capital April 16, 2014. The Middle East is being shaken by an intensifying sectarian war stretching from the Mediterranean coast to Iran. And all signs suggest that the situation created by the ongoing war in Syria — which has spilled over into Lebanon — and the Sunni insurgency in Iraq will get much worse before it gets better. “The way things look and have progressed over the course of many months demonstrate the region is still hurdling into a highly sectarian future,” Phillip Smyth, a researcher at the University of Maryland and expert on Shia militias, told Business Insider in an email. The Obama administration, which has largely stayed on the sidelines in Syria, has sent U.S. Special Forces to Iraq in an effort to collect intelligence on extremist militants rampaging in the north of the country and protect U.S. interests in and around Baghdad. 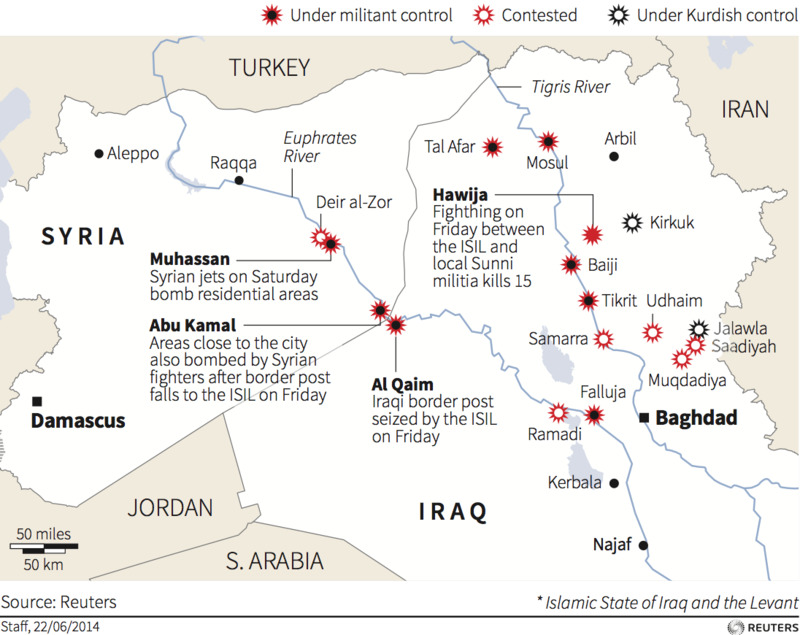 The problem is that the most dominant Iraqi forces on the ground are backed by Iran. Qassem Suleimani, the head of the Qods Force, the foreign arm of Iran’s Revolutionary Guards Corps (IRGC), is directing Baghdad‘s reaction to the crisis (much like he has done for more than three years in Syria). Consequently, Washington is working in parallel with a group whose slogan is “Death To America” as well as Iran-backed Shia militias who boast about killing Americans during the Iraq War. Two weeks ago, right after fighters from the Islamic State of Iraq and ash-Sham (ISIS) overran Iraq’s second largest city, Smyth detailed how Iranian proxy militias had already been recruiting and fighting in Iraq. That was months before Maliki, powerful Iraqi Shiite preacher Muqtada al-Sadr, and Iraqi Shia spiritual leader Grand Ayatollah Ali al-Sistani called for mobilization in early June. In other words, Iran is two steps ahead of everyone. And the crisis in Iraq plays into their larger geopolitical strategy of dominating the Middle East by claiming to be the defenders of Shi’ites and an enemy of terrorism. What can the U.S. do? Not much. Obama said that any U.S. military assistance “has to be joined by a serious and sincere effort by Iraq’s leaders to set aside sectarian differences.” But the opposite has happened. And given that the Obama administration has prioritised ongoing Iran nuclear negotiations over all else in the region, Washington is largely at the mercy of the geopolitical circumstances. All in all, the region faces increasingly sectarian crises that are becoming more interrelated every day. “Based on a steady progression of events, it would appear that the Levant [i.e., the Eastern Mediterranean] will be on fire for some time into the future,” Smyth told BI. Add the growing sectarian war in neighbouring Iraq to the mix — in addition to the increasing threats to Iran, Jordan, Saudi Arabia, and Israel — and, it looks like the Middle East will be burning for the foreseeable future.